New Key to Costa Rica 2008 http://mapcr.com/information/1965/60/Costa-Rica-Sabine's-Smiling-Horses.html Sunset and moonlight tours, and tours to waterfalls. Sabine carefully selects horses for children to ride, and kids will enjoy her farm, with ponies, ducks, rabbits, and guinea pigs. 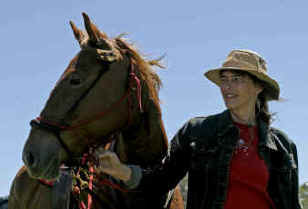 Horselovers can volunteer at the farm. Sabine has a nice vacation house for rent. Rural community tours (one day and three days/two nights) to visit artisans and farmers and learn about their lives and their work. We also lead a half day socioeconomic tour. http://www.sleepingwiththetoucans.com Sleeping With the Toucans is a new book with detailed, experiential reviews of our favorite 100 small hotels, eco-lodges, and B&Bs in Costa Rica. The web page provides some additional information not in the book, including descriptions and pointers to a larger number of services and environmental and community development organizations. http://www.costaricareisen.de is one of the most important web site for Germans interested in a door way to Central America's nature habitats. Horses HQ at http://www.HorsesHQ.com a Valuable Horse Directory and Information Resource. Hotels in Monteverde direct booking!!! Benefit goes directly to the owners. http://www.monteverde.co.cr Hotel Finca Valverde in Monteverde is one of the nicest places I know of in the village and still hidden form the business in town. Nice cabins, trails and look-out points. http://www.lacolinalodge.com the very nice owners make sure you are very welcome and warmly hosted. service for Australian and International punters. Mean temperature : 16-18 C (61-64 F) Annual rainfall : 3,000 mm (118 inches) Dry Season: December to March. 225 km northwest. of San Jose, 3h30 by 4x4, 4h30 by car, 5h by bus. Population of Monteverde: 250. Population of Santa Elena: 6,500. Altitude, village Santa Elena: 1,250 meters or 4,100 feet, highest trails: 1,800 meters or 5,900 feet. Because we are near the equator the sunrise is roughly at 5h30 am & sunset is at 5h30 pm all year long. See our Costa Rica Sunrise Sunset Time Table or this educational page about why season changes (opens in a new window). You can take a bus at 6:30 AM or at 2:30 PM. You can ask for the old Puntarenas bus stop, at Calle 14, avenida 11 y 9 . The morning bus pass by Lagartos at about 9 h AM arriving in Monteverde at 11h AM. The afternoon bus pass by Lagartos at 5h PM arriving at 7h PM, later in wet season. There are 2 buses: one at 1:00 PM (via Las Juntas) and one at 2:00 PM (direct). The 1:00 PM bus pass by La Irma, and the 2:00 PM bus pass by Lagartos at 3h PM both arriving in the village at 5:00 PM. There are buses from Nicoya, Santa Cruz, Tamarindo, Flamingo, Playas del Coco, the Nicaragua Border and Liberia. Taking one of these buses, you can go to Lagartos and La Irma and hop on one of the Monteverde buses. See above, San Jose. The bus leaves Tilarán for Monteverde at 1 PM, arriving at 3.30 PM approximately, later in wet season. Don't eat a big meal before, it's a bumpy ride. From Southern Pacific beaches: Ballena National park, Uvita, Dominical, Matapalo, Quepos, Manuel Antonio, Jaco, Herradura, go to Puntarenas. Live Quetzal cam in the Monteverde Costa Rica Cloud Forest Reserve! Live Colibri (humming bird in Spanish) can in the Monteverde Preserve. See more than 80 spectacular photos & short descriptive texts about the Cloud Forest wildlife found in the Monteverde Costa Rica Preserve on the website of Cloud Forest Alive managed by the Tropical Science Center: the not for profit organization managing the Preserve. http://www.acmonteverde.com/iacm.html The Monteverde Conservation League - a non-profit organization dedicated to the conservation of the tropical forest. http://www.mvinstitute.org The Monteverde Institute - a non-profit educational association by Monteverde residents, the MVI blends international study and research with educational and cultural opportunities for local Monteverde communities. Monteverde Costa Rica Cloud Forest research data base Over 125 ecologists, agriculturists, and educators have contributed to the natural history and ecology of the area. Our objectives are to bring together the extensive body of knowledge that researchers and natural historians have gathered; to point up connections, to identify areas for future research. Extensive bibliography related to Monteverde. Monteverde Natural History - Plants & butterflies of Monteverde: Identification and Other Resources by William A. Haber. Monteverde Costa Rica type of Rain Forest Types of Rain Forests: a tool for young students, and naturalists, informatory and educational . Monteverde Friends School - bilingual (Spanish and English) school serving preschool through high school students in small, multi-age classes. Founded 50 years ago by the original Quaker settlers who left the United States for Monteverde Costa Rica. Now primarily serves local Costa Rican children as well as children of North American parents, this non-profit school is looking for volunteers & contributions. http://www.tierrapreservada.org/ Foundation for permanent preservation of land and natural resources, including Costa Rica and other Latin American countries. Monteverde Costa Rica Priory Travel Guide Stuart M Melvin's Independent travel guide & photos. Nice photos of Monteverde, Costa Rica, Argentina, Galapagos, Ecuador, Zimbabwe, etc.! Beautiful photos of birds of Costa Rica. Stunning! Costa Rica's Hot Spots for birders. Lots of links to great photo sites. http://www.coffeetraders.com/monte.html Montana Coffee Traders - if you live in USA and would like to buy online fair trade Monteverde's cooperative coffee. http://www.coffeefarmerscoop.com/coffees.html if you live in USA and would like to buy online fairtrade Monteverde's cooperative coffee. http://home.knuut.de/Peter.Sparlinek/co_cr.htm A personal travel report about Costa Rica, with some nice photos, and informative comments. http://www.banales.net/daniel/archive/basement/photos/index.html Nice photos of Costa Rica, Japan, Indonesia, Malaysia, Korea, Thailand, etc. http://www.werne.com An interesting website about a one-year trip through Central- and South America, with travel notes and lots of photos. Lacsa/Costa Rica Airlines - now part of Taca. La Nacion Costa Rica's national news paper (English weekly summary version also on this site). http://www.cia.gov/cia/publications/factbook/geos/cs.html The CIA's Costa Rica Factbook page. http://www.casapres.go.cr/enlaces.html links to the websites of Costa Rica's government as well as the site of the President, including ministries, Independent Institutions and State Banks. http://www.geocities.com/westcornersville/costarica.html Brandt's Palm & Tropical / Subtropical Tree Page, photos taken during his Costa Rica trip. http://www.zurqui.com/crinfocus/info.html Costa Rica In-focus - Easy access to information about products and services in Costa Rica. http://www.forwiss.uni-erlangen.de/~alewand/costaric/fotos.htm Travelogue of Costa Rica, and nice photos. http://www.infocostarica.com Good general info on Costa Rica. Lots of links. http://www.cocori.com Experience ecological projects, tourist destinations, how people live, work and play in this tropical paradise. http://www.rainforesttram.com See the rain forest through the eyes of a wild bird, the Rain Forest Aerial Tram. http://www.worldheadquarters.com/cr/protected_areas National Parks of Costa Rica. Missing private non-profit reserves, like Monteverde. http://www.TravelsInParadise.com Backpacking & budget travel guide for Honduras. Maya pyramid ruins of Tikal and Copan photos & many other places. http://www.planeta.com Eco Travels in Latin America - Virtual library for those interested in eco-tourism in the Americas. http://jrscience.wcp.muohio.edu/html/index.html Tropical Ecosystems: Coral Reefs, Rainforests & a Potpourri of weather, Earth Science, etc. http://www.ecofuture.org/ecofuture/pk/pkorgs.html Extensive web resources and info, dedicated to sustainability and the ecological future of our planet. http://www.tarantulaplanet.org A neat site, everything you want to know about tarantulas! http://www.Eco-Portal.com site which is very unique in allowing you to search the Internet for the best ecological resources. http://perso.wanadoo.fr/pm.blais/index.anglais.html Orchids of France Provence, and Mediterranean Orchids. http://www.samexplo.org/ South American Explorers, an information web for travelers (non-profit).